I shouldn’t have jolted when I read the report of Cup & Saucer closing, but I did. While New York City businesses are constantly on the precipice of hanging up “Liquidation” signs, such closings are hard to take when speaking of the same storefronts you bought your first album from with allowance. Where your favorite childhood book was discovered and purchased for you by a loved one. The one place you could always depend on for a hearty bite to eat. These locations are where memories are born and as the food industry rivals retail in being the most beleaguered in New York, the diner Cup & Saucer is the latest casualty of the former. As nostalgia wardens have stressed, Cup & Saucer closed not because of customer complaints, or lack of business, but–cue the broken record–an exponential spike in monthly rent, this time by 99 Canal Realty ($7,600 on top of an already hefty $8,200, equaling $15,800 a month! ), this past Monday, July 17. I received the alert from Vanishing New York, the blogspot that has chronicled the rupturing (and disappearance) of New York City’s storied landscape of independent, iconic, mom and pop shops and eateries, forced to close because of rent hikes, for ten years this summer. 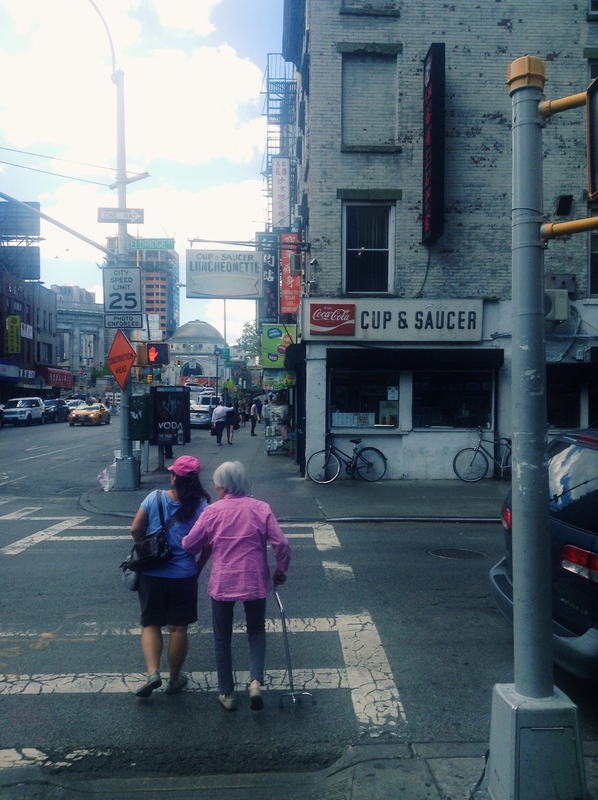 It was through a thorough Google search for classic New York establishments that led me to Cup & Saucer. Out of the short list of spots to visit I made from that BuzzFeed list, I was eager to see the diner that looked straight out of the Mean Streets of 1970s New York and Stevie Wonder‘s “Living for the City” on the radio. The day I went was in August 2015. A warm day outside from what I can remember. It was also one of my last in New York. I had planned to move back home to Boston at the end of the month. I didn’t want this to happen, but I felt my Cup & Saucer lunch was going to have a side of somber, accentuated by the fact that the diner was under my nose the entire duration of my twenty-something life here and I was just now making a trip. I knew Chinatown well enough, but 89 Canal Street, on the corner of Eldridge, was a mystery. I found the nook and cranny after slightly walking around in circles and Cup & Saucer looked just as dilapidated and charming as it did in pictures. It is strange to pair those two words together in order to describe it, but you would’ve felt the pull too. No matter how chipped away the paint outside might’ve been. Breakfast had passed, but I was going to indulge in it anyway, as Cup & Saucer served the first meal of the day all day. I chose a stool facing the window, as already seated patrons drank coffee I assumed was black and ate in solitude. The diner was classic in every aspect of design. The other soft-cushioned stool chairs lined in front of the raised counter. Behind the counter were ovens, grills, and stove tops releasing heat and smoke swirls. The menu above was bright enough to be read (lots of bright navy blue) and so fraught with options, it’s a wonder we consider American food so basic. Also, short and rectangular in shape, Cup’s colors were mainly neutral. Not at all ceiling to floor Day-Glo like some imitation of a 1950s diner where young women used to giddily congregate and the neighborhood boys bought them milk shakes. (You could’ve, however, gotten a pastel milk shake at Cup & Saucer). The only thing missing was a jukebox or dial-up radio. In minutes, I was handed a menu by a soft-spoken waitress. Skimming the proverbial club sandwiches, omelets, chicken wings, and soup, I ordered a classic triple stack of pancakes and, knowing me, bacon or turkey sausage. Upon arrival, with the maple syrup beside the window, I lifted it to join my humble delicacy and my eyes gazed out the window, reflections competing for attention in my mind. My New York life was coming to a close. How did I end up here in the first place? (Sheer determination, that’s how). What had become of New York City? What were the good old days made of anyway? I hate New York, but I love you too. To place a foodie hat atop of my head, I rate the food as great. The pancakes tasted like pancakes and were fluffy enough to make me full before I could devour the third. I made sure even after I was done eating, to remain sitting and watched pedestrians walk by, bicycle ride by, in yellow taxis on the other side, going about their day in a city as capricious as New York City. I paid for my meal that was less than $10, with the waitress from earlier, at the cash register next to a super cute glass donut case. I was thanked and out the door, I went, officially cementing my only Cup & Saucer experience. I looked back to see the sun continue to cast an afterglow in the diner through the windows. I had always wished to return. Cup & Saucer’s ragamuffin look on the outside, and modest to a fault decor on the inside delighted because it was so honest and the food was reliable. The announcement of its closing from current owners John Vasilopoulos and Nick Tragaras ran the gamut from local blogs like Untapped Cities to Crain’s, as most commented that this was another glaring failure of New York City to preserve a receding diner culture. It’s a shame as next year would’ve been 30 years on Canal Street for Vasilopoulos and Tragaras, and more than 70 years total for the Cup & Saucer business. It joins legendary hangouts and restaurants like Elaine’s and the original East Village location of Lucky Cheng’s on the growing list of what used to comprise New York City’s undeniable penchant for the unordinary amongst the everyday. The classic Coca-Cola logo next to the faded black lettering of CUP & SAUCER, and equally as faint “Luncheonette” on the side, I will miss for the nostalgia, aesthetically. On a deeper level, what those letters stood for, in all its fadedness, was the legacy of the diner which we know now, despite its closing, was tenacity.